So you have a twitter account, you know how to use it and you’re in contact with some of the other people on the 23 Things course. Now what? Find other people to follow. Following people within your area is a great way to expand your network. Even if you don’t personally interact with the people in question, having their tweets added to your feed can be hugely beneficial. For instance once you follow a wide range of people in your area, your twitter feed soon becomes full of an interesting and diverse range of articles, papers, videos and podcasts which people link to in their tweets. There’s so much information on the web and so much content posted on Twitter that being selective about who you follow is necessary if you want to cut through the clutter and find what you’re interested in. In this way Twitter can function as a form of social filtering, helping us find content online which will be useful or interesting to us. Exactly who you follow will shape the extent to which this is the case and it’s something which rewards work and thought. But how do you know who to follow? A great way of finding people to follow is to use the lists feature. 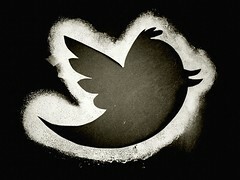 This allows Twitter users to create lists of people within a particular area. Go to each of the lists linked below and look through the people listed in them. Is there any one you want to follow? If so then select ‘follow’ and you’ll rapidly have a wide range of academics in your Twitter network. Now we’ll explore how to engage with your network on Twitter through replies, retweets and hashtags. Replies are self-explanatory: they are tweets you send in response to someone else’s tweet. Retweets takes someone else’s tweet and forwards it to all your followers e.g. if you thought the tweet was interesting and want to share it with others. The step-by-step guide for thing 9 describes how to reply and retweet in the context of using hashtags but please note that anything on twitter can be replied to or retweeted, even if it has no connection with a hashtag. Hash tags are a way to mark a tweet as being about a certain topic. For instance if I tweet about BBC Question Time during the show, I’ll mark the tweet with the hashtag “#bbcqt” e.g. “not convinced by government minister’s answer #bbcqt”. This hashtag is an established convention, encouraged by the BBC show’s producers, to facilitate discussion about the show. When you click on the hash tag in a tweet, or enter it into the ‘search’ box at the top of the twitter interface, all tweets marked with the hashtag will be displayed. In this way hashtags let Twitter uses see what people are tweeting about events, issues or topics.